The promotional campaign for Deadpool 2 has been one hell of a hilarious rollercoaster. There was the Bob Ross-themed first teaser trailer, followed by the Good Housekeeping special edition cover story, and now we have a trailer set to the theme song from the 1980s sitcom the Golden Girls. "Thank You For Being a Friend" is played while the cast of Deadpool 2 is introduced with a cheesy font, echoing the 80s. 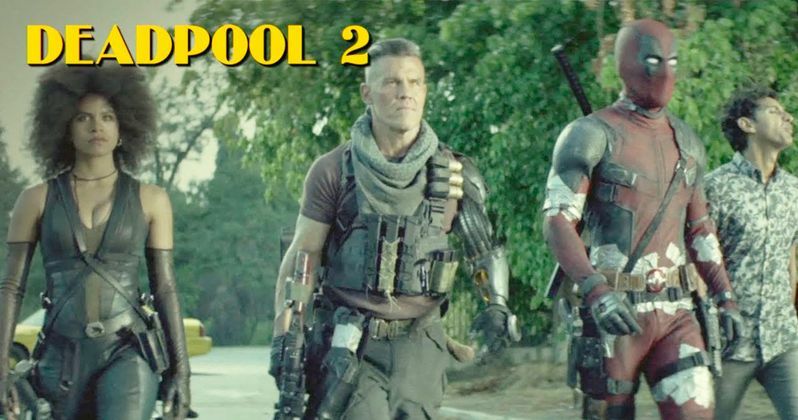 The juxtaposition of the lighthearted song and the hard R-rating of Deadpool 2 make for a pretty hilarious remix and should get everybody ready for the holiday weekend. To get fans excited about the holiday weekend, Deadpool 2 released the Golden Girls remix trailer in an effort to steal some of the thunder from Solo: A Star Wars Story, which will easily dominate the box office this weekend. The Golden Girls has been a favorite of Ryan Reynolds for quite a while. Back in April of 2015, he revealed the names of Wade Wilson's Katana swords: "The Katanas are named Bea and Arthur. Bea is a dedicated performer and a joy to work with. Arthur's grumpy-wumpy." Deadpool 2 has been killing it at the box office, surpassing initial predictions worldwide, but falling below the earnings from the first movie domestically. After one week in theaters, the sequel will be crossing the $400 million mark after this weekend, which is no easy feat. Additionally, the Deadpool 2 carries an R-rating, making the feat even more awesome. However, the R-rating hasn't worked out well for one particular member of the cast. 15-year old Julian Dennison still isn't allowed to see the sequel in theaters, revealing that he was able to introduce the movie at premieres, but not able to sit through the entire movie. In Julian Dennison's home country of New Zealand, you have to be 16-years old to watch Deadpool 2, so he can't even watch it at home, which is pretty ironic considering that Dennison has some of the craziest jokes in the sequel. All that being said, there's no way that Dennison hasn't seen Deadpool 2 all the way through. Ryan Reynolds and Josh Brolin had to have taken him to a private screening or something. Maybe they could even make an edited screener for the young star. Anyway, it's the start of a holiday weekend, and the Merc with a Mouth really wants you to know that Deadpool 2 is still in theaters, so go to your barbecues, enjoy your family and friends, but make sure to see Deadpool 2 again. The Golden Girls remix has been such a hit that even surviving Golden Girl Betty White shared the new trailer on social media, unofficially giving her ringing endorsement of the raunchy sequel. You can check out the brand-new Golden Girls and Deadpool 2 remix trailer below, thanks to the 20th Century Fox YouTube channel.